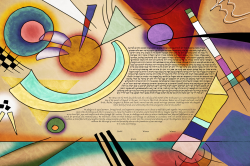 Russian painter Wassily Kandinsky is arguably one of the first pioneers of abstract art and form. Kandinsky utilized basic form and geometry -- building a collection of work that was both though provoking and subtly modern. His works truly stood out for their daring simplicity and unique style, serving as an essential source of inspiration for a uniquely modern Ketubah.